McKinsey Research Again Reports Cultural and Ethnic Diversity Outperforms Gender Diversity. Why? McKinsey’s latest study of diversity in the workplace, Delivering through diversity, reaffirms the global relevance of the link between diversity—defined as a greater proportion of women and a more mixed ethnic and cultural composition in the leadership of large companies—and company financial outperformance. The new analysis expands on the management consulting firm’s 2015 report, Why diversity matters, by drawing on an enlarged data set of more than 1,000 companies covering 12 countries, measuring not only profitability (in terms of earnings before interest and taxes, or EBIT) but also longer-term value creation (or economic profit), exploring diversity at different levels of the organization, considering a broader understanding of diversity (beyond gender and ethnicity), and providing insight into best practices. Growth across diverse consumer markets – Diverse employees can better understand and respond to the needs of varied customers. Many companies hire employees from different backgrounds because they personally represent the tastes, sensibilities and interests of a broad range of customer segments. As populations become more diverse, through immigration and cultural changes, this factor becomes increasingly important. Effective global partnerships – A diverse workforce increases access to new suppliers and the formation of positive partnerships with other stakeholders such as policy-makers or investors across global markets. A pipeline of top local and global talent – Rapid economic growth globally, and particularly across Asia Pacific, has increased the demand for skilled talent, in some cases straining the ability of the local labor market to keep up, particularly in countries with low and falling birth rates. In response, companies are widening their recruitment efforts, past talent pools they may have overlooked in the past to build a robust pipeline of global and local talent that can support future growth. Improved problem solving, decision making and increased innovation – The greater variety of ideas and perspectives accompanying a diverse workforce increases the breadth of solutions available for problem-solving, promotes more critical information-processing in decision making, prevents groupthink, and challenges and changes existing business practices and assumptions to drive innovation in the firm’s practices and products and services. Improved management of legal and reputational risk – Diverse workforces also improve compliance with local employment laws, for example, quotas for hiring people with a disability or ethnic groups, and contribute to a firm’s corporate social responsibility efforts by improving workforce participation rates of traditionally marginalised groups. In many markets, employee diversity improves the organisation’s image and is particularly important for attracting millennial and female consumers and talent to the organisation. Studies indicate that social responsibility values such as diversity are valued highly by members of those groups. In this way, workforce diversity is a valuable brand differentiator. As McKinsey’s research and other studies show, the impact of cultural diversity on organisational outcomes may be magnified relative to other sources of diversity. Cultural diversity is most likely to involve differences in perspectives, knowledge, and experience necessary for optimal information processing, decision-making and innovation, and for understanding the needs and concerns of different consumer segments and diverse stakeholders at home and across borders. Simply put, cultural diversity involves a broader diversity of thought than other diversity dimensions. Consider, for example, gender diversity. Gender is a large part of our identity that is often defined by our psychological differences as men and women. Psychological differences are reflected in many gender stereotypes –e.g.men rarely share their feelings, while women are more emotional – but research has found that, in reality, men and women are more alike than we think. A team of researchers recently conducted a meta-synthesis of more than 100 meta-analyses of gender differences (a study of studies of studies of gender differences). Combined, the studies they aggregated included more than 12 million men and women. Their report, published in American Psychologist, identified only 10 psychological attributes in which there was a significant gap between genders. Some of these characteristics fell in line with stereotypes. For example, men were more aggressive while women had a closer attachment to peers. Conversely, they found an almost 80 per cent overlap between the genders for more than 75 per cent of psychological characteristics, such as risk-taking, occupational stress, and morality. Simply put, gender differences are not so profound as John Gray, from the Men are from Mars, Women are from Venus fame, suggests. Physically, yes. But, psychologically, no. Across cultures, however, 90% of our differences are psychological, while only 10 per cent are tangible or visible differences. The iceberg provides a useful analogy. The small ‘tip’ of the iceberg that can be seen above the water level represents visible cultural elements. Visible cultural elements include artefacts, symbols and practices such as: art and architecture; language, colour, and dress; social etiquette and traditions. 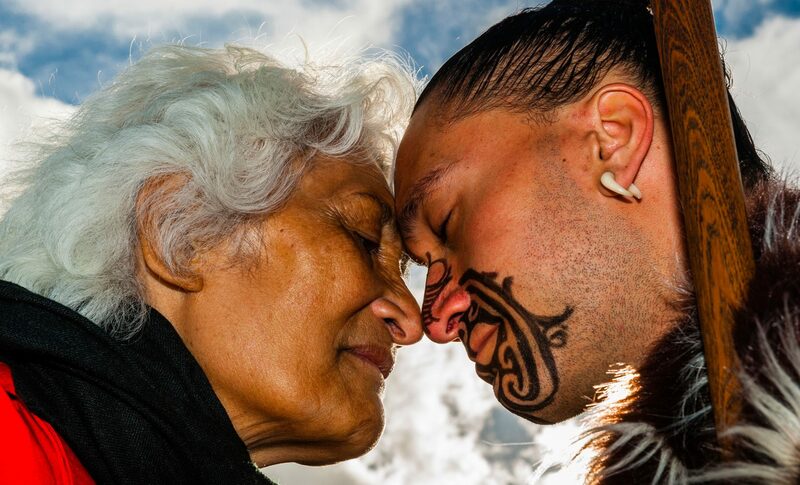 However, although they are the most obvious, visible cultural differences like dress, language and rituals make up only ten per cent of our cultural identities. 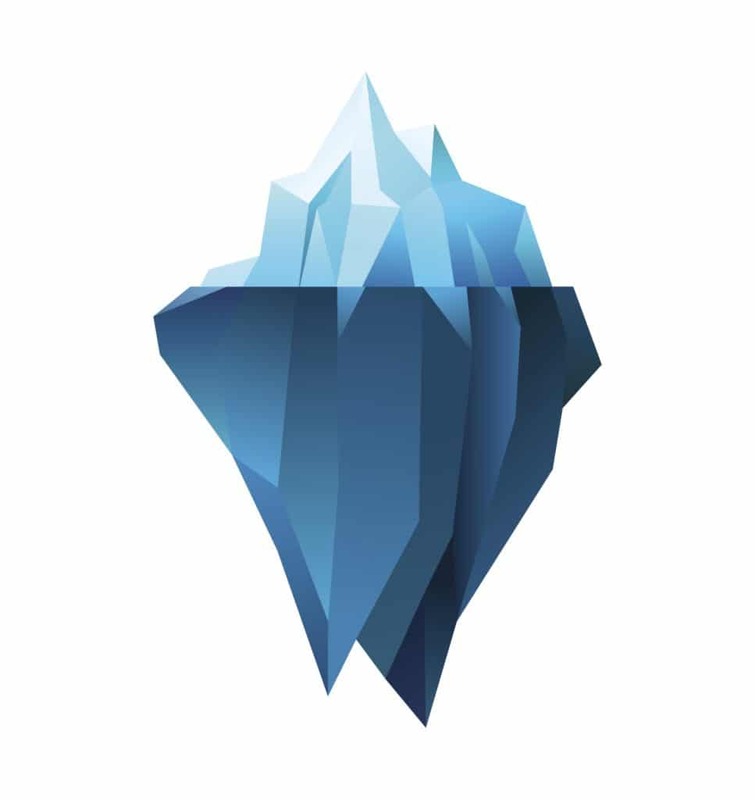 The 90 per cent of the iceberg that remains unseen below the surface represents the hidden cultural differences. Hidden differences are mental concepts like values, assumptions and beliefs. Although we are often fixated on the tangible elements of culture like dress or language, most of our cultural differences are differences in the way we think. Differences in thinking across cultures were demonstrated in a study in which Americans and Japanese were asked to take a photo of a person. 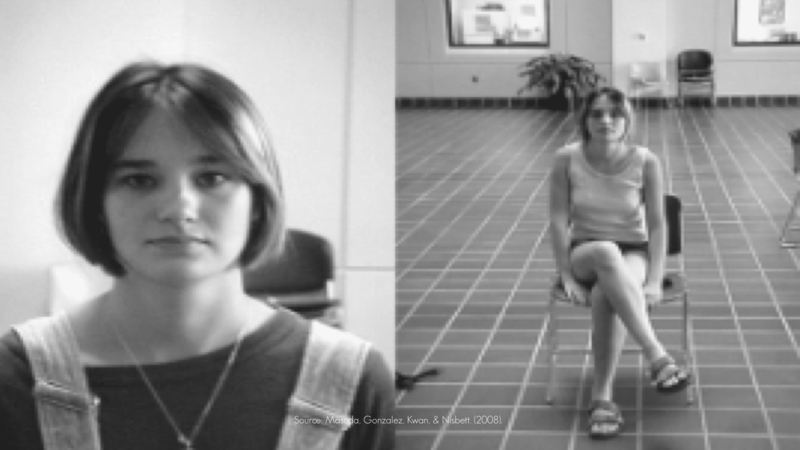 Whereas Americans displayed a preference for taking close up photos (left), the Japanese photos gave relatively greater weight to the person’s context (right). In another study, researchers asked participants to report whether the flower at the bottom of the picture below was more similar to the group of objects on the left or the group on the right. East Asians were more likely to match the target flower with Group 1, and European Americans were more likely to match the target flower with Group 2. 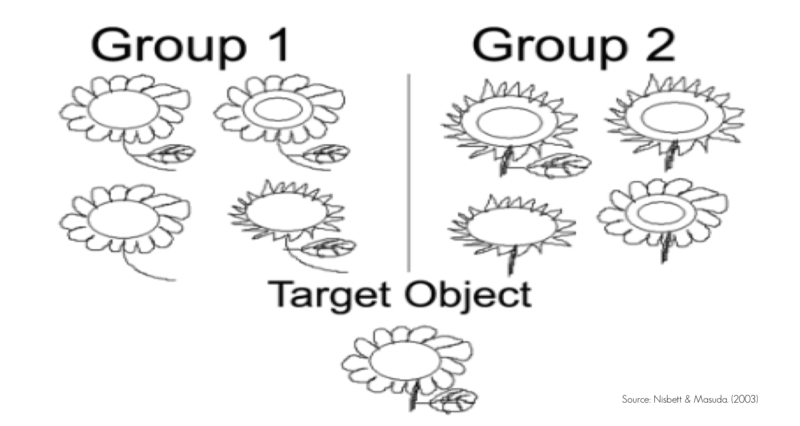 The East Asian participants perceived the target object in a holistic fashion, in which the target flower shares a number of features common to the group of objects on the left when considered as a whole. In contrast, the European Americans analysed the individual features of the flower and allocated the target to Group 2 on the basis that all items shared a straight stem. Those studies, along with others, show while Westerners exhibit object-orientated attention in which greater weight is given to understanding the property of discrete objects, Easterners exhibit context-sensitive, holistic attention in which the relationships among elements are important. Westerners display an analytical thinking style that focuses on salient objects independent of context, whereas Asians exhibit a holistic thinking style that considers the relationship of the object to its context. This diversity of thinking styles across cultures is a tremendous advantage in terms of optimal decision making and innovation. Analytic thinkers pay close attention to the details of a problem without considering contextual influences, whereas holistic thinkers consider the background elements. Analytic thinkers break a problem down into smaller parts and focus on the individual components, progressing from the micro to the macro. Holistic thinkers start with the big picture, considering the whole first and the interconnectedness of elements. Whereas analytic thinkers make decisions using logic, holistic thinkers use intuition or emotion to make decisions. Today’s business problems are new and complex. They require novel solutions. A diversity in decision-making style encourages the consideration of alternative solutions and supports creative problem-solving. Organisations that can successfully elicit and integrate the diversity of thought accompanying culturally diverse workforces are best positioned for breakthrough innovation.